When I was young and naive, I had planned to build a nice Nepalese architecture style house in Sydney. I wanted to buy land and bring craftsmen from Nepal to construct this dream home. I wanted to use wooden Nepalese style windows and doors. Make every part of the house as Nepali as possible. I also wanted a garden with a pagoda and dunga dhara (stone water feature). I still want to make it one day if I win a lottery but for the time being I need to dream a little smaller. 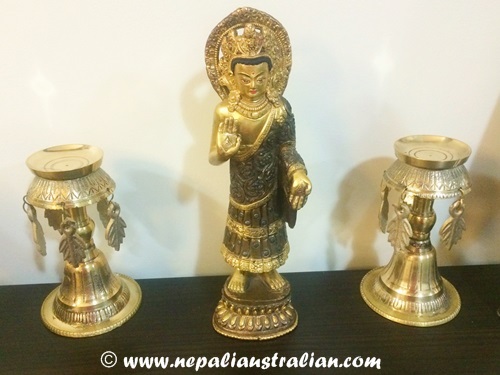 When we bought our place here in Sydney, it didn’t have anything Nepalese; it was a modern building with modern interior. Still I wanted people to get a feel of Nepal when they visit our place so we tried our best to bring Nepal into our living room. When people visit us, the first thing they notice will be a big oil painting. The painting is of a landscape of Nepal with mountains, hills, village style house and everything Nepalese. It is around 5 feet by 3 feet. There is a long story behind the painting. It took us a while in Nepal to find the painting and we are glad that we managed to get it. We brought it from Nepal but got it framed in here. The next thing they will notice are two Nepalese handmade carpets in the dining area and living area. 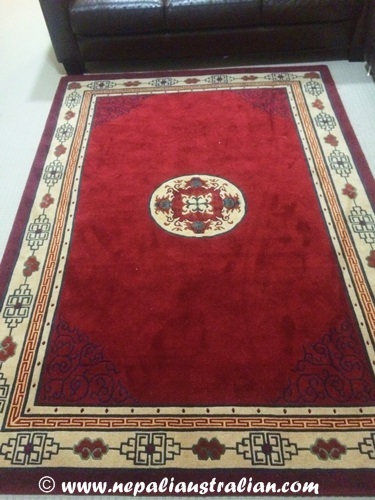 We were really lucky to get these carpets. 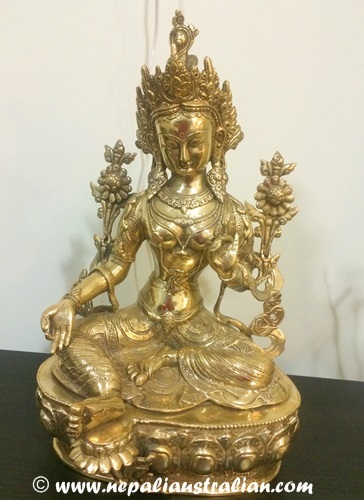 We also have a large statue of Goddess Tara displayed on one side of the TV cabinet. On the TV table, I also have a statue of Buddha and the supari from our wedding. On the buffet table, I have a statue of standing Budda and two panas. 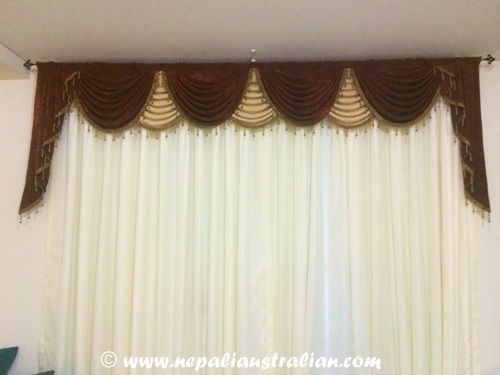 I also got the window valance custom made in Nepal. It is not really Nepalese style but I like it. I still have a few things planned to make the room more Nepalese but I am happy with the outcome. 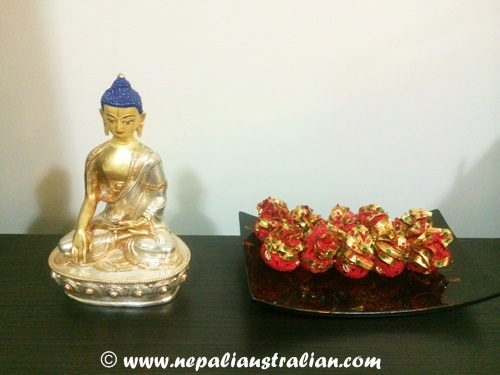 What do you think of my Nepalese collection :)?Please share what did you bring from your heritage to your home? 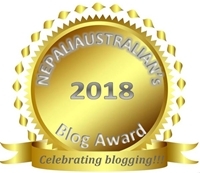 This entry was posted in Personal and tagged buddha idol, dunga dhara, giddess tara, Nepal, Nepalese architecture, Nepalese carpet, Nepalese style door, Nepalese style windows, nepalese vardts, nepali carpet, Nepali style house, panas, style windows and doors. Bookmark the permalink. Amazing post, if you need to put some Thangka paintings on your wall feel free to contact us! Is it possible that you do not put that painting of mountain annapurna range with village,bridge and river in your page please. BECAUSE many they trying to copy and sell at next door here in nepal.We made this painting.PLEASE. wow.. you brought the valance all the way from nepal! wasn’t it too heavy? You are so right, home is where the heart is and right now it is where AS is 🙂 I am lucky to have so many good stuffs in life for sure and I do appreciate it. :), Take care Robin. That’s a beautiful painting you have there M…I have couple of paintings of himalayas and villages and a khukuri too..what I would really love is painting of temples, alleys (chowk) and jatras of Kathmandu..will have to find some when I go back home. Nepal’s architecture is incredible, love the wood carvings, tiki jhyaa and dhunge dhara. I hope you can build your dream home.😀. Love everything on this post. Wish you’ll get closer to your dream everyday.